The CUBITY project was intended as a platform from which to develop a future-oriented concept for student housing of the future, a topic which is currently being intensively researched. Housing shortages among students present a serious problem in nearly all European university cities and are increasingly gaining social relevance. The CUBITY project was intended as a platform from which to develop a future-oriented concept for student housing of the future, a topic which is currently being intensively researched. Housing shortages among students present a serious problem in nearly all European university cities and are increasingly gaining social relevance. 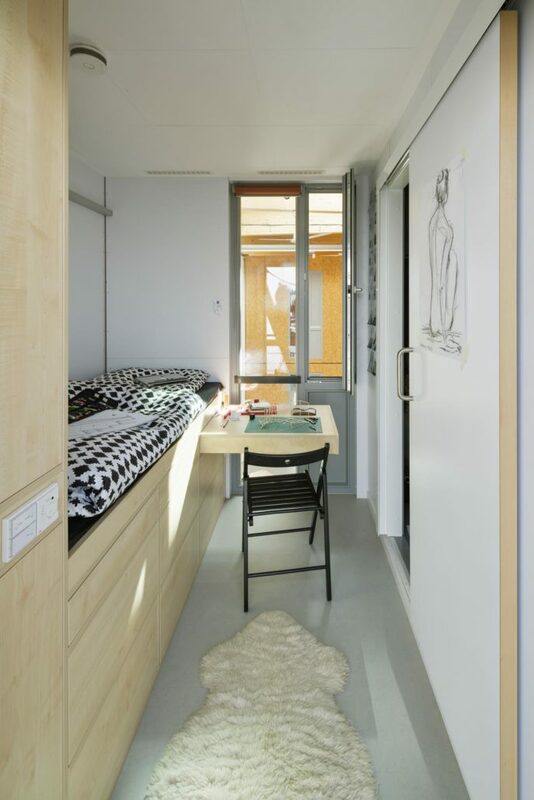 The fact that housing for students is not available in sufficient quantities, is too expensive or is not of sufficiently high quality opens up an important area of activity for architecture. Resources are scarce: a lack of subsidy programs, few suitable sites, on which to build and existing dormitories that have conventional spatial concepts, which are more likely to promote the isolation of students than prevent it. In discussions about sustainability, the question of sufficiency arises not only when talking about raw materials and energy consumption. With regard to student housing, this means: how is student housing defined? In what sort of atmosphere would students like to live and work? What is unnecessary? What can be reduced? Or, from an energy perspective: How can a student dormitory be self-sufficient, i.e. satisfy its own energy needs? The clearly defined goal, to plan and built the student housing under plus energy aspects, combined with the aim of modularity, mobility, flexibility, economic and resource efficiency was a huge challenge, due to the reciprocal influences. The combination between energetic and sociological aspects is creating a new and interesting field of research. CUBITY returned to Germany after the Solar Decathlon Europe 2014. 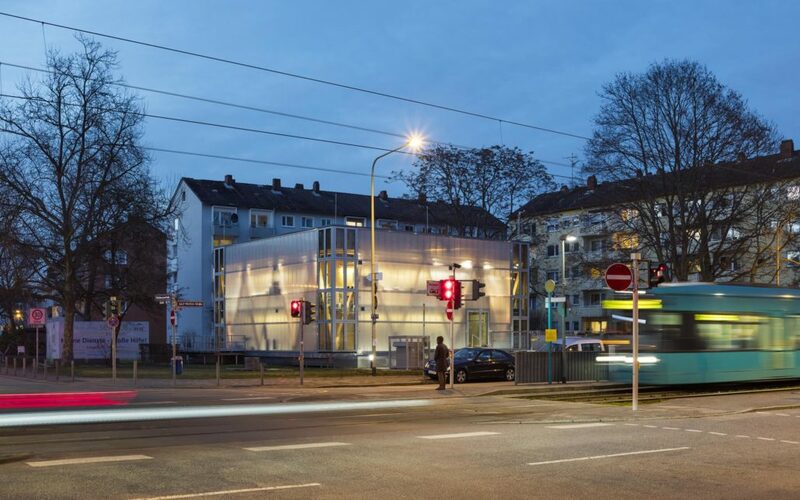 At first it was planned to rebuild it in Darmstadt as a “LivingLab” with twelve student inhabitants and research several aspects of the buildings concept and optimizing the prototype leading to its marketability. The final site for the reconstruction was found in partnership with the Unternehmensgruppe Nassauische Heimstätte WohnStadt (NH). The NH is hessians biggest housing association and provided for CUBITY´s reconstruction an innercity site in Frankfurt am Main / Niederrad. The Studentenwerk Frankfurt am Main participated aswell in the project and offered to manage, support and rent the cubes to students from Goethe University Frankfurt and Frankfurt University of Applied Sciences. The building application for CUBITY was filed on 09.10.2015 at the construction supervision Frankfurt am Main and was approved on 13.11.2015. After the installation of the future inhabitants in November 2016, the energetic and sociological monitoring of the second research phase of CUBITY began. The investigation of the coherency of the planning and functioning in day-to-day operations and the simulation and realization of the concept both in terms of the users and the use of the building as a LIVING LAB aims at an overall optimization of the technical systems and the structural elements, as well as at a social scientific evaluation of the spatial concept. The installed technical infrastructure makes the evaluation of energy efficiency and user comfort possible, and at the same time, it also allows the optimization of the energy system. The energy footprint of the project will also be made evaluable through the preparation of a life cycle assessment. The evaluations are part of a holistic approach and make conclusive statements, in particular about resource efficiency, possible. The energy monitoring assesses the building performance in order to evaluate the energy balance and identify the potential for optimization. At the same time, the comfort monitoring serves to guarantee and optimize comfort parameters such as temperature, humidity and CO2 concentration. The automatic ventilation is of particular focus and is monitored closely, in order to compare the conditions set out in the air-flow simulation with reality. The active description of functions evaluates the operational quality of the building services, the correctness of the defined functions and their components. An automatic target-actual comparison evaluates, identifies and corrects the configured parameters and the conditions. The goal of the social scientific monitoring is to test the users’ acceptance of both the building and its innovative energy and spatial concepts. The social scientific monitoring will record the subjective perception of comfort and compare this to the measured physical values, but also include an analysis of the interactions among the residents, and between users and the PlusEnergy building. To do so, the residents and their day-to-day life in CUBITY will be intensively observed for twelve months. In the context of a Post Occupancy Evaluation, the architecture sociologist Moritz Fedkenheuer will monitor the housing experiment and analyze it from the perspective of the users. He will visit CUBITY at regular intervals and gather data using various empirical social research instruments. The residents will be asked to talk about their impressions, experiences and feelings in individual interviews. Group discussions will allow collective opinions and negotiation processes to come to light. The fact that the social researcher will move into CUBITY himself for a few days each month is particularly exciting and promising, allowing him to document life in the building as completely as possible through participatory observation. All of these non-standardized methods have the advantage that they can record events and changes in the LIVING LAB, in particular with regard to the behavior and perception of the users, in a very detailed way. In addition, written and standardized measurement instruments, such as questionnaires, will also be used, in order to facilitate the comparison with other dormitories. The data gathered will be continuously backed up, processed and intensively analyzed. The hypotheses which guided the research will be tested on the basis of the social scientific evaluation and the CUBITY project will be assessed with regard to its functionality from the perspective of the users. The reduction of energy use in building operations conserves above all energy resources. With progressive reduction of the operational energy, energy and resource consumption for the production, maintenance and disposal of the buildings becomes increasingly relevant. Therefore, the choice of building material and structure becomes central, in particular with regard to resource conservation and the reduction of negative environmental effects of building construction. In order to make this measurable, the life cycle analysis method has been developed. A Life Cycle Assessment (LCA) analyzes the entire life cycle of a building with regard to its environmental impact in various categories (greenhouse effect, acidification, ozone depletion, etc.). This includes the production, maintenance and disposal of the building structure, as well as the building operation. Numerous factors significantly influence the LCA of buildings. Analog to life cycle costs, relevant decisions with regard to the life cycle analysis are made in the early planning stages. Basic considerations regarding the choice of material, but also innovative architectural concepts like that of CUBITY, can positively influence the LCA. 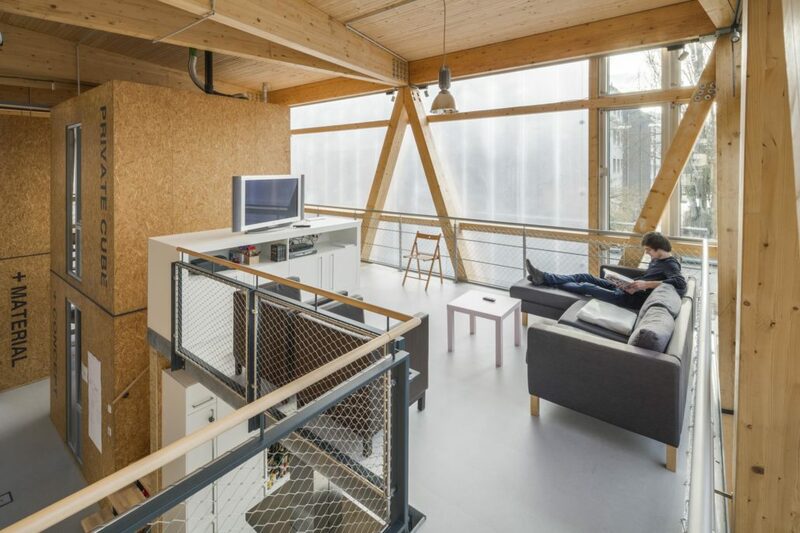 The German Association for Sustainable Building (DGNB e. V.) has set out a range of specifications for LCAs based on international norms, thus allowing comparability. For the LCA of CUBITY the regular assembly of the components and their quantities in the building were evaluated; connections were not considered. For the assessment of the building operation, an EnEV calculation and a computation of the yield from the photovoltaic installation were used. The assessment was made through a comparison with the reference values from the German Association for Sustainable Building for the new construction of housing with more than six housing units, version 2012 (NWO12). 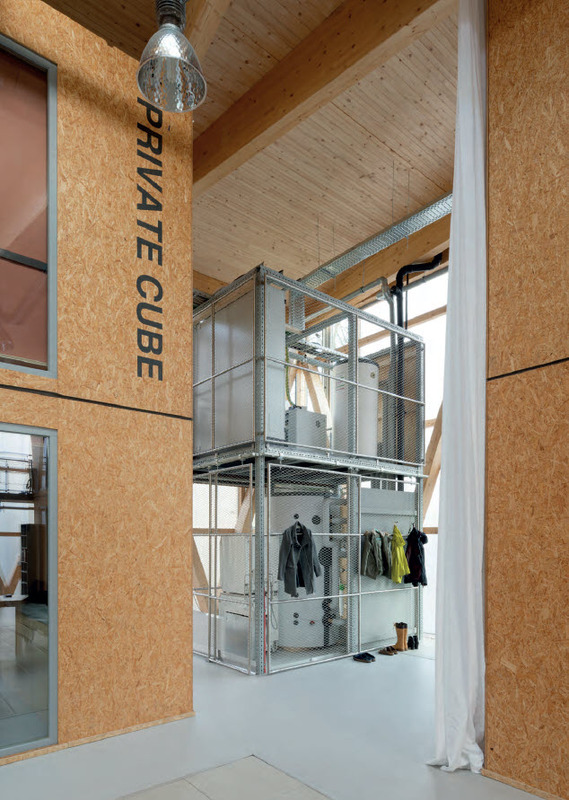 In all of the examined environmental impacts, CUBITY demonstrated lower emissions than a conventional building with an energy supply in accordance with the German Energy Saving Ordinance (gas condensing boiler with solar thermal energy, exhaust air system). 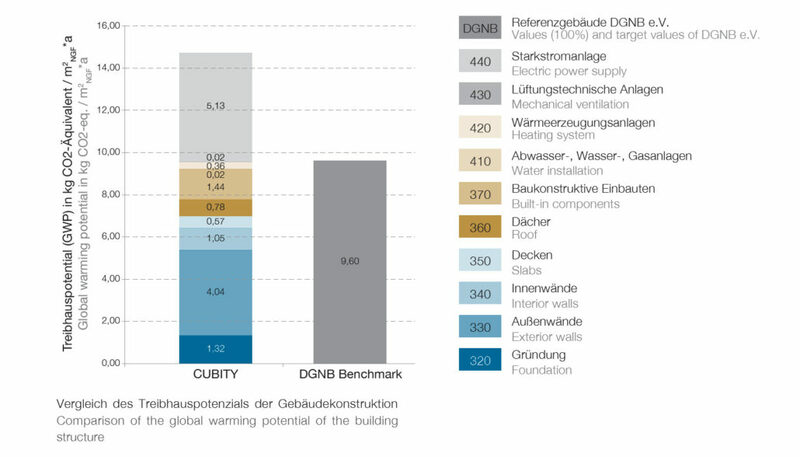 In six of the seven categories, CUBITY fell well below the DGNB’s target values for a sustainable building. 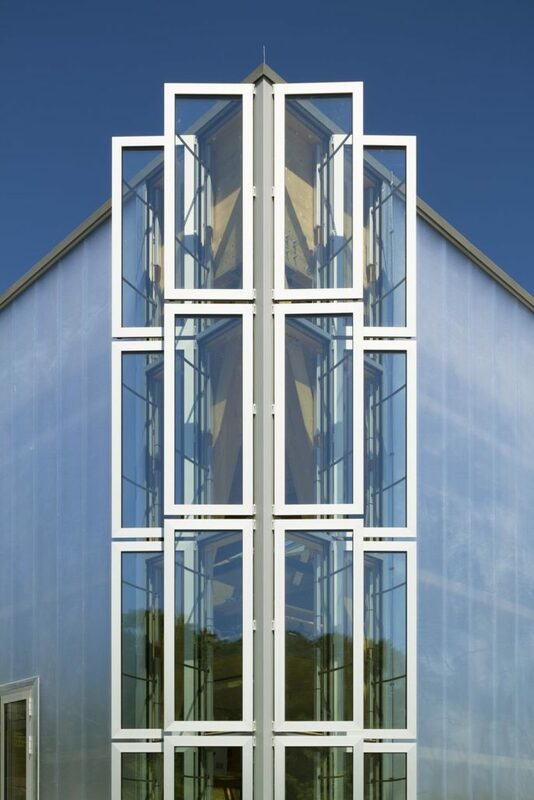 The savings are to a large extent due to the building’s energy production from the photovoltaic system. Through the conversion of sunlight into electricity, the use of electricity from non-renewable energy sources through the power grid is reduced. In addition, surplus energy is fed into the municipal energy grid, replacing electricity from non-renewable sources there as well. Both of these mean that the environmental impacts of the building operation are less than zero in some categories. CUBITY thus has positive effects on the environment through the production of renewable energy for others. The savings in the building construction are, in contrast, more modest in comparison to the DGNB reference building. 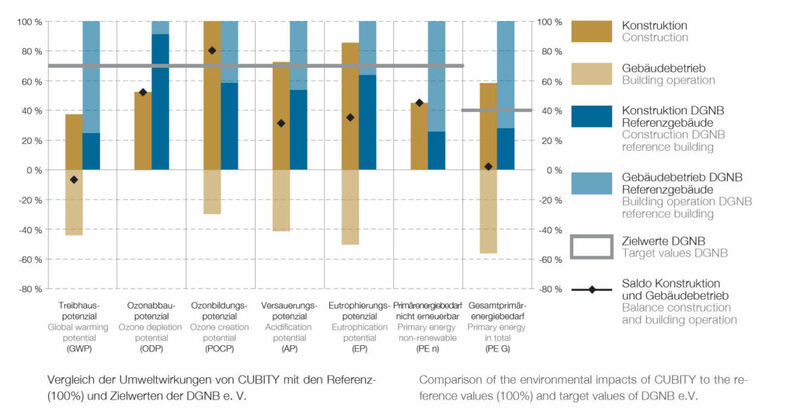 The results of the life cycle analysis of CUBITY for the category “global warming potential” (contribution to climate change, measured in kg CO2 equivalent) of the building structure (production, maintenance and disposal, without operation) are depicted in the illustration “Comparison of the environmental impacts”. The global warming potential is generally higher than that of a conventionally designed building (DGNB reference building). In particular, the exterior walls (cost class 330) and the high voltage systems contribute significantly to the global warming potential of the building structure. 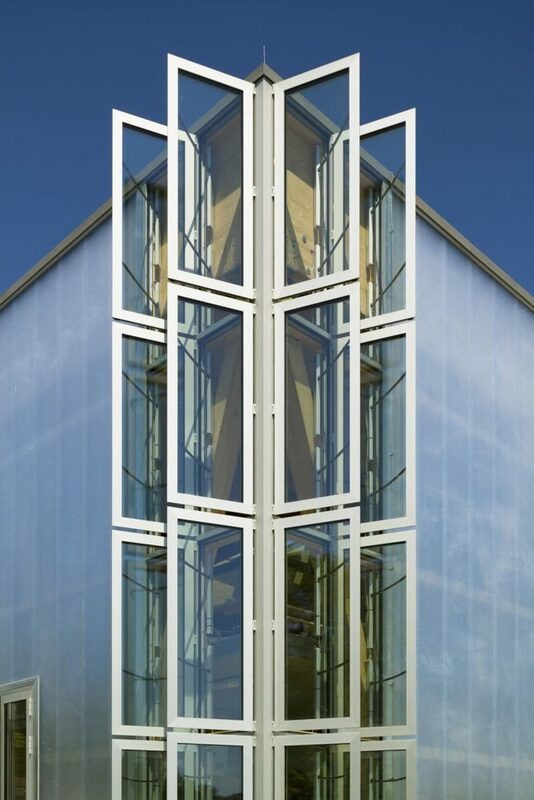 For the exterior walls, the highest contributions come from the polycarbonate façade and the aluminum windows— see upper circle chart. The wooden support structure is, in contrast, CO2 neutral and does not make a visible contribution to this category. For the high voltage systems—see lower circle chart—the emissions result almost entirely from the production by the photovoltaic panels. These are, however, a prerequisite for the reduced environmental impact in the operational phase.